There's a new trend in the wine world that might interest you beer drinkers out there. Cutting-edge American vintners are experimenting with ways to overcome the natural sweetness of the grape and produce wines of intense sourness. The inspiration for these sour wines lies in some obscure European styles, but the Americans are adding their own innovations, such as using yogurt bacilli as part of the fermentation process. Sour wines are admittedly an acquired taste, but sophisticated oenophiles are increasingly willing to pay premium prices for them. Sours are some of the most expensive wines among recent vintages, because of the great technical skill and attention it takes to produce them, and the unpredictable and sometimes lengthy fermentation process. Only joking. There is no Sour Wine Craze, it's just something I dreamed up as I pondered the sour beer craze. 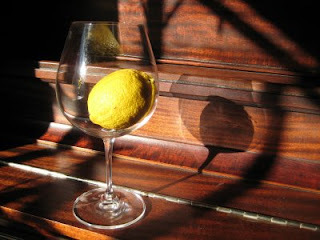 Some tartness is not unusual in a wine, but no one would buy a wine whose sourness stood out over all its other flavors. Can you imagine wine snobs paying, say, $75-$100 -- my attempt to translate $10-$20 beer -- for sour wine? Can you imagine Mt. Tabor Fine Wines holding an event like Puckerfest? I guess those things are imaginable, but in light of the fact that fine wines have a bigger audience to date than fine beers, if it hasn't happened yet it probably won't. Then why have sour beers caught on? One guess is that a lot of beer connoisseurs are themselves homebrewers, who appreciate the technical finesse and cultural background that goes into sour beers. Or maybe it's simpler to just say there's no accounting for taste -- after all, not everyone shares my enthusiasm for bitter medicinal liqueurs, and I did just recommend that people try the drinking vinegars at Pok Pok. About a week ago I dutifully went out and tried Deschutes' The Dissident and Roots' Flanders Red on consecutive days. They both are very big beers, 9% or so, and lovely to look at. As you've guessed, I don't particularly like sour beers; that said, I give the edge to Roots, maybe because it was less sour than the Dissident. On the other hand, both breweries have so many beers that are to my liking, that their sour ales are just a curiosity to me. Try Duchess de Bourgogne, which I'm sure I spelled wrong. It is lower in alcohol and is sweeter up front, which balances out the sourness at the end. Because of the lower alcohol content it is not as dry either. From what I understand it is a great representation of the style. And if you liked the Roots over the Dissident, don't try Russian River Suplication, it will turn your face inside out! Hi Joe: I had the Duchesse from a bottle 3 or 4 years ago. I wasn't as plugged in to beer fashion at the time, and I thought it was ridiculous. A friend brought some Supplication to my house last summer. I realize that I'm showing my lack of sophistication, but I just don't get it. I wrote about it at the time. Bill - it is what it is. I hate Belgian Wit beers. I think coriander is an awful spice that should not be anywhere near beer. I tried 5 or 6 different types until I just gave up. I quick confession, I poured the Allagash White right into the garbage can at OBF. There is a good chance I'll be killed by the Craft Beer Mafia for that comment. I don't think it has anything to do with not getting it. You get it just fine, you just don't like it. I think too often we beer people get caught up in having to like everything that is craft beer. I only suggested the Duchesse because I think it is a more balanced and approachable beer. I'm happy to know that I'm not the only one that "doesn't get" some of the beers out there.